Pia Mellody and her training team with Mandy, Dita and Victoria from Charter! 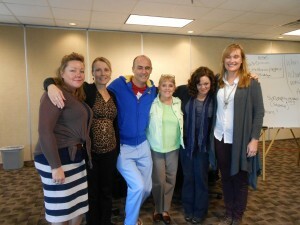 Last week I was fortunate enough to attend a week of Post Induction Therapy with Pia Mellody in Arizona. The model is focused on recovery from the relational trauma that manifests painfully later in life in self-destructive processes such as addiction, codependence and dysfunctional relationships. As you can see from the photos I am not good at having my picture taken and closed my eyes to the experience! I also do not have a great reputation for attention in class, with past school days littered with truancy. (We teach best that which we most need to learn…!) But last week I was captivated. Not all week I admit as I found the lecturing a bit tiring, but the information itself, the model, is wonderfully human and accessible. It makes sense, and is interwoven with personal experience, crucially demanding that the therapist also is well! The genuine integrity of the model was reinforced by the humility of the teachers. Both Pia and Sarah, who was co-facilitating, were keen to teach yet not hungry for applause. In fact Pia regularly yet subtly sidestepped the guru status that was often laid at her feet instead asserting the model as the prize and encouraging personal responsibility. The PIT model aligns easily with the therapeutic model at Charter, which is also borne of hard graft and personal experience and it should be relatively easy to integrate the two. This means the clients will experience more bodywork and shame reduction work, paying increased attention to relational childhood trauma and to the 5 core symptoms of codependence Pia describes in her books. We will also provide an intensive 3-day Trauma Reduction Workshop every 6 weeks which is inspired by ‘Survivors’ (The Meadows). This is not a self-indulgent model it is an operation. It’s all about going home and getting on with your life, which is like a breath of fresh air. Thank you too to my travel companions and co-trainees, Dita and Vic. Getting to know you and spend last week with you was really special and enormous fun and I am privileged to have you on the Charter team. This entry was posted in Addiction, Mental Health and tagged adolescent addiction, alcohol addiction, binge drinking, co-dependence, Counselling, depression, drug addiction, Drugs, psychotherapy, recovery, the meadows, Trauma, trauma training, weight, women with addiction by Mandy Saligari. Bookmark the permalink. I’m so pleased to see codependency being represented and worked through so positively in treatment. So often in my recovery I experience it being cast aside as something that ‘doesn’t apply’ to people’s experience of addiction. Slowly I’m learning more and more that this for me, is the foundation of addiction, and the areas of my that are being openly acted out are branches that have stemmed from this insidious disease of codependency. I cant stress enough how much my life has changed from following this model of Pia Mellody’s Trauma Reduction Programme. Thank God Charter has brought it into awareness.